The BioMedic Peel is a light dermablading or sometimes called dermaplaning, procedure that removes the top layer of dead cells of the skin. Dermablading or dermaplaning is achieved by using a small surgical blade to scrap away the dead skin cells. There are light chemicals applied after the dermablading that is designed to reduce brown spots, fine lines, and boost the skin's overall radiance. This dermablading treatment is ideal for individuals with Rosacea and patients who have sensitive skin. The BioMedic Peel is a procedure that removes the top layer of the skin using a dermablading or dermaplaning technique by our highly-trained esthetician. This helps to remove the dead cells of skin to allow the light chemical peel to penetrate more effectively. It is designed to have remarkable results on reducing the brown spots, fine lines and boost the overall radiance of the skin. This can be performed on even the utmost sensitive skin including those who suffer from Rosacea. What Happens Before BioMedic Peel? Before a BioMedic Peel, the patient should avoid Dermal Fillers or Botox injections for 10-14 days before the treatment. Before receiving treatment, the patient should be off Retinol and exfoliation products for 5-7 days. No tanning bed or sun for 7 days prior to the treatment. What Happens Post-Care for BioMedic Peel? There is no downtime for this dermaplaning treatment. The patient's skin may be a little pink for thirty minutes to one day. Makeup can be applied after treatment; however, there should be no tanning through the natural sun or tanning bed for up to 72 hours. Vitalize Peel is a dermal chemical peel that has been formulated to minimize fine lines and melanin spots that occur as the result of aging and exposure to the elements. Vitalize Peel is recognized as suitable for all skin tone types and complexions by utilizing a specific formulation of peeling agents, which include: alpha-hydroxy acid, beta-hydroxy acid, resorcinol and retinoic acid. The Vitalize Peel treatment utilizes a formula of acidic formulations that encourage exfoliation of the epidermis (top layer of skin) and encourages the molecular restructuring of collagen. The exfoliation and restructuring of the collagen tissue effectively reduces pore size, smoothes ruddy complexions, and improves the texture of skin, resulting in the appearance of a healthier and more resilient complexion. 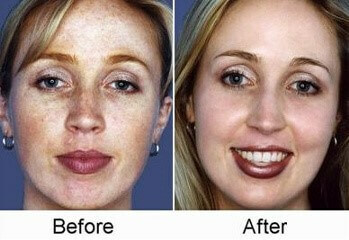 What is Vitalize Peel Used For? Vitalize Peel is used by individuals seeking to decrease the appearance of fine line wrinkles, restore an even skin tone and diminish scarring which may occur with acne. Vitalize Peel is an effective treatment to utilize in conjunction with other treatment programs such as laser skin resurfacing, which is often used as treatment in more complicated dermal issues such as melasma (brown splotching caused by hormonal changes and other factors) and discoloration of the skin caused by post-inflammatory hyper-pigmentation (post-surgical scarring). What is the Recovery Time Post-Treatment? 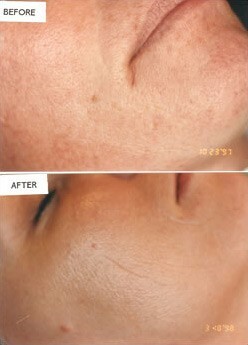 Normal activity may resume immediately following a Vitalize Peel treatment. Patients may expect skin peeling for approximately one to three days post-treatment. The amount of peeling will vary for each patient based on the treatment area and skin type. This is normal and may be concealed with the use of an over-the-counter moisturizer, which will be recommended by the aesthetician. Our deep chemical peels, TCA or Jessner, are designed to restore blemished, acne scarred, uneven, or sun-damaged skin. Once the treatment has occurred, new cells and collagen will be stimulated during the healing process in order to produce a tighter, smoother, age-defying look. The depth and type of peel is dependent upon the patient's skin type. The Deep Chemical Peel, like Jessner and TCA, are a medium depth peel designed for more extensive damage. They are made from salicylic acid (a beta hydroxy acid), lactic acid (an alpha hydroxy acid) and resorcinol. These Deep Chemical Peels penetrate beyond the top layers of your skin and can be used on your face and chest. What Happens Before Chemical Peel? The patient should not be in the sun or tanning bed. The patient should also be off of any Retinol products for 7 days. What Happens Post Deep Chemical Peel? 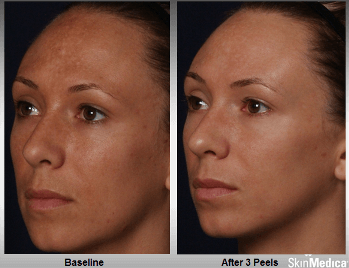 The Deep Chemical Peel requires 7-14 days down time. You can expect a complete sloughing or peeling of skin for 7 days. On a return visit within 7-10 days, an oxygen treatment will help restore cell growth with different vitamins and antioxidants. Every peel will cause some degree of flaking or peeling with varying amounts of redness post-procedure. The degree of flaking and redness is dependent upon the acid strength and type. The day after your procedure you could start to feel tightness. During the next 7-14 days flaking and/or peeling could occur. If you do not experience any flaking or peeling that doesn't mean that you will not achieve the optimal results. All peels will create sensitivity to heat and sun for several days post peel and it is critical to the success of the peel that you comply with post procedure care requirements.